In a previous post I mentioned a few reasons I try to avoid commercial bread. Not all of us have the time to make homemade bread on a regular basis, so instead I’ve started avoiding it all together. I wanted to share with you one of the ways I’ve switched from carb & gluten-filled sandwiches, to delicious, healthy snack-wiches! Cucumbers. They’re crisp, they’re fresh, and they’re 95% water. Sounds great. Now cucumbers themselves are not innately exciting, but their health benefits are! A source of vitamin K, B vitamins, copper, potassium, vitamin C, and manganese, cucumbers are a great choice. Not only that, but cucumbers can help reduce inflammation. Cucumbers are not only a great source of vitamins, they are low in calories and high in fibre, making them a great choice for both weight loss and general digestive health. 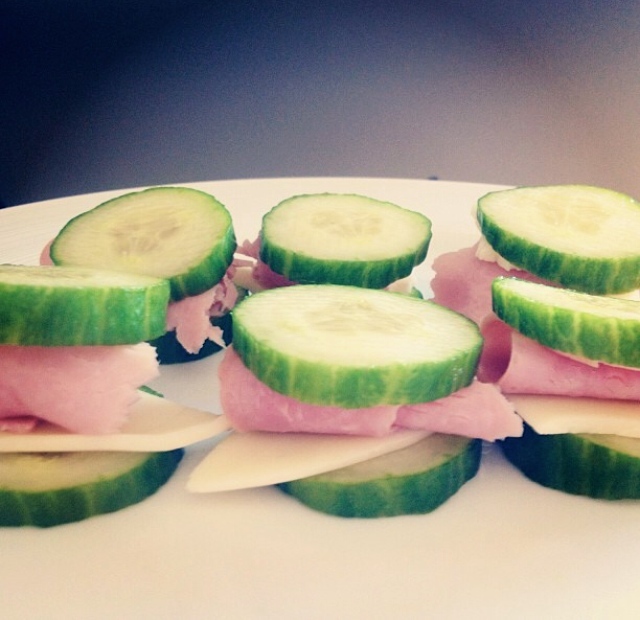 Instead of bread, try making little snacks with cucumber. The possibilities are endless! I like to use lean meats, greek yogurt, homemade tzatziki, pesto, hummus, and other spreads to create a breadth (pun intended) of healthy, delicious snacks. Perfect alternative to sandwiches! Thanks for checking out the cucumber post on my blog as well, us new bloggers have to stick together!